To make this card, you'll need the following supplies. Clear Plastic Circles from the top of Pringles, dairy cartons or similar! 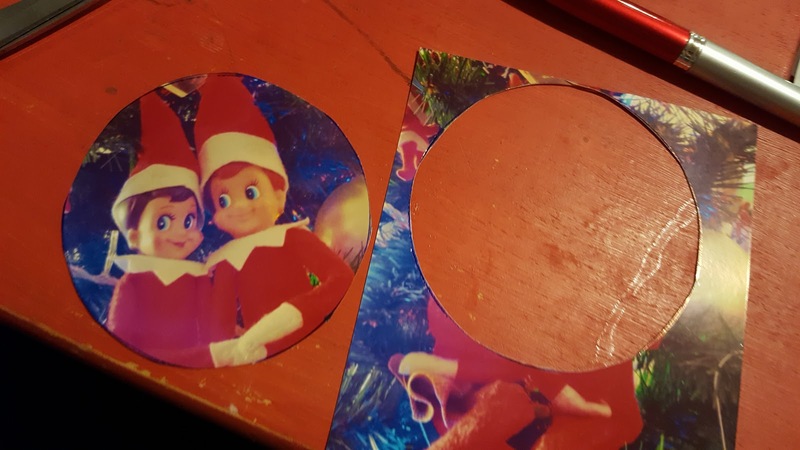 I had a few pictures of the Children that I printed off, along with a few of Jingle and Belle, our Elf on the Shelf Elves and used the Pringle lid to trace round the area we wanted to use. 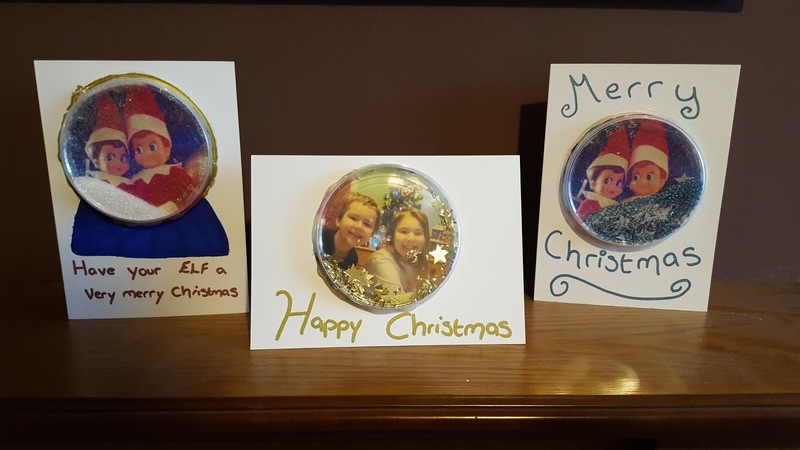 However you can use a drawing or wrapping paper, or anything that you don't mind being displayed on the front of a Christmas Card. The Children were quite happy to share the responsibility of tracing the circle on the photograph and to cut out the circles. They did however complain that I should be paying them for this child labour. Luckily I managed to talk them out of this, and they agreed to make some more cards with me later this month, when they see what other designs people are linking up! I honestly can't wait. Once we had the photographs cut out, we made a bit of a mistake. You see, to start with I stuck the photograph to the card which was a bad move. 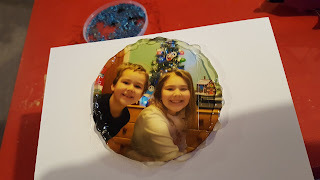 What I should have done (and we did we subsequent cards) was to fill the Pringle lid with glitter or beads and then hot glue the photograph to the lid, before finally sticking the photo to the card. That way, it gave a much neater edge to the snow globe, but if I'm honest they were all a little messy, but I think it adds to the "We made these with our own little hands" honesty of the cards. Lastly, we played around with a few ideas to finish off the card. We tried to draw a snow globe base on to one of the cards, we left it blank on another and we even attempted to decorate around the snow globe to disguise all that hot glue! 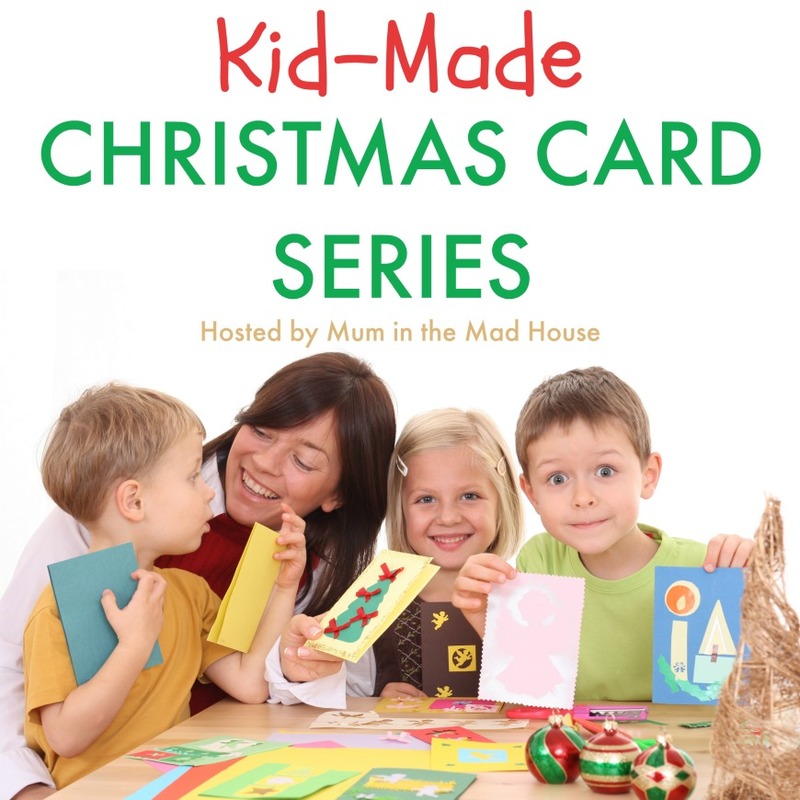 However you finish off your cards, I'm sure that you'll love spending time together creating something to give to family and friends this Christmas. If you'd like to see other cards, don't forget to see the cards that went live yesterday a Snowman Hand Print card which looks amazing and I'm not sure I could ever make mine look that cute and these brilliant Christmas Tree cards, which look great fun to make and use buttons! 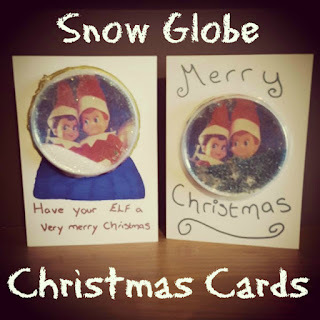 Don't forget you can check out the whole Kid Made Christmas Card Series at Mum in the Mad House and let me know if you try and make my Snow Globe card!